As much of the world enters the deep freeze of February, the wooden hearth of a sauna has an appeal almost equivalent to a tropical vacation. Solhem Sauna of Duxbury, Vermont tries to integrate its hand crafted, custom-designed saunas into a landscape -- placing them by a pond, or in a wooded glen -- making the outdoors part of the experience. Solhem has now extended this respect for natural resources to the very source of their products -- the world's forests -- by achieving certification by the SmartWood program of the Rainforest Alliance. Nils Shenholm, founder and principal of Solhem Sauna, began researching and designing saunas in 1986, and in 1990 tested the first prototype. Production began with 1-2 saunas per year and has steadily increased to 6-10 per year. While Solhem (Swedish for "Sun Home") Sauna's approach is to continue the tradition of sauna as a free-standing structure, separate from the dwelling place, Shenholm also designs indoor saunas. 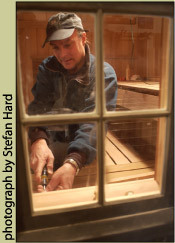 His unique approach to sauna building combines a thorough understanding of modern construction technology as well as a deep respect for tradition. 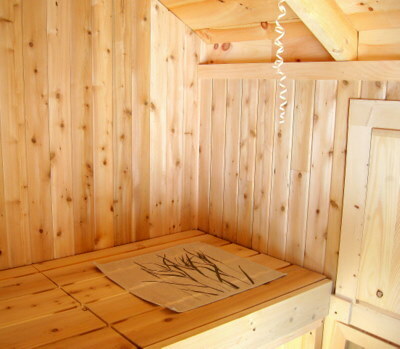 The saunas are assembled from both certified and non-certified solid softwood components, in compliance with the FSC's stringent percentage-based claims guidelines. Text Copyright © 2002 Rainforest Alliance. While still fully supporting the mission of the Rainforest Alliance and the FSC, Solhem Sauna withdrew from the Certificate program in the spring of 2009. 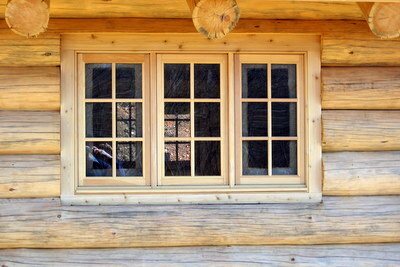 We remain committed to the ideals of forest conservation and will be happy to secure FSC lumber for your sauna upon request. © 2010 Solhem Sauna. All rights reserved.